Port-au-Prince, Haiti (CNN) -- Nearly a third of the patients at a makeshift hospital in earthquake-ravaged Haiti will die without immediate surgery, a doctor warned Saturday. "Within the next 24 hours, approximately 30 percent of the patients in the hospital need immediate surgery or they're going to die," Dr. Jennifer Furin, from the Harvard Medical School, told CNN of the roughly 300 patients at a makeshift hospital on a United Nations compound near Port-au-Prince's airport. "They will die of infections, they'll die of dead tissue, they'll die of malnutrition and metabolic derangements," she said. The screams at this temporary hospital have crescendoed since Tuesday's earthquake, and medical workers futilely tried to ease pain with morphine. The loudest cries came from those with pelvic fractures so severe that their bones protruded through their skin. Furin said rumors and talk of setting up an operating room abound, but that nothing has materialized. "Every day as the sun starts to go down, the hope, most importantly, of the patients are dashed, as yet again there's nowhere to send them for these necessary life-saving surgeries," she said. One team, from the Israel Defense Forces, began setting up a surgical field level hospital at an abandoned athletic field. "They're the first ones who are going to be operating," Furin said. The Israeli delegation of 220 arrived at the Antoine Izmery soccer field Friday to begin setting up tents and equipment. Its doctors and other medical personnel anticipated treating about 500 casualties a day. Much of the aid will be focused on helping any survivors of the destroyed U.N. headquarters in the capital, Port-au-Prince. 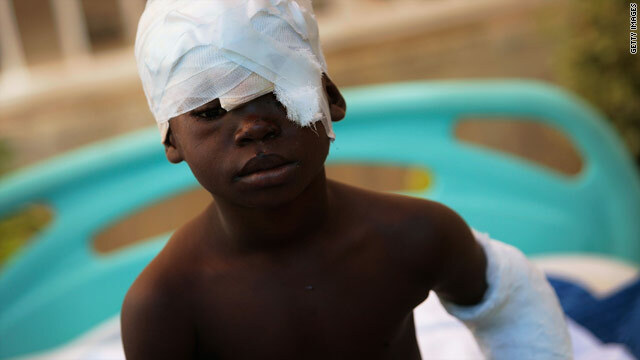 Overall medical efforts were concentrated in the Haitian capital of Port-au-Prince, where most of the buildings were destroyed or heavily damaged. In one hospital, where Cuba had sent doctors months earlier to train Haitian doctors and others in the Caribbean, hundreds of patients have been treated, a CNN crew reported. The doctors at the hospital, who had been joined by other medical personnel from Spain and South America, were treating severe injuries, including compound fractures, flesh wounds, and performed amputations and surgeries, the CNN crew reported. Elsewhere, search-and-rescue teams were combing the city for other victims. Those units included security officers and dogs trained to find survivors, the IDF said. Also Saturday, the USNS Comfort, a U.S. naval hospital ship staffed by a crew of 64 and 560 hospital personnel, left the harbor in Baltimore, Maryland, on a trip that will take about five days. The arrival of the Comfort will add much-needed facilities. It will supply fully-equipped operating rooms, a 250-bed hospital, digital radiological services, a medical laboratory, a pharmacy, an optometry lab, a CAT-scan and two oxygen producing plants. The ship has a deck capable of landing large military helicopters. Lt. Gen. Russel Honore, a CNN contributor, described the Comfort -- which is three football fields long -- as "a moving emergency room." On Friday, the aircraft carrier USS Carl Vinson arrived off Haiti's coast, carrying 19 heavy-lift helicopters and 51 hospital beds, three operating rooms and the ability to produce hundreds of thousands of gallons of water per day, according to U.S. military officials.